For pricing and additional information regarding the Gefen Pro Series, please contact us at 877-586-6654. 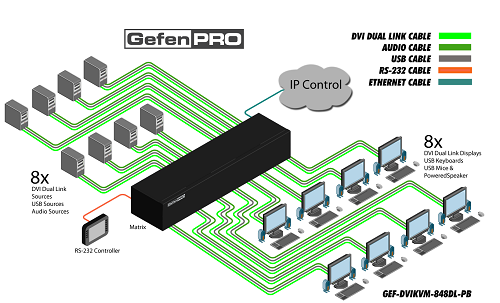 The GefenPRO GEF-DVIKVM-848DL-PB 8x8 DVIKVM Dual Link Matrix with Push Button Control provides a professional-grade KVM solution to route DVI, USB, and Audio from any eight computers to any eight Hi-Def workstations. Dual link resolutions up to 3840x2400 are supported. Audio can also be routed with the video using mini-stereo cables to provide full multimedia content for digital signage applications. The front panel display shows the current routing status and the front panel push buttons are used to manage local source routing. The USB input and outputs are used for USB 2.0 compliant devices and they support keyboard and mouse functionality as well as other USB 2.0 peripherals such as hard drives, USB cameras and more . Independent audio routing allows audio to be routed separately from the video. Each source can be controlled from any workstation by using the front panel push buttons, an included IR remote, the RS-232 interface, Telnet, IP control via the built-in Web interface, or the Gefen Keyboard Controller software. The Gefen Syner-G PC software provides easy firmware updates. Connect up to eight KVM source devices to the GefenPRO 8x8 DVI KVM Dual Link Matrix with Front Panel Push Button Control using the supplied DVI cables. Connect up to eight monitors to the DVI outputs. Connect the USB devices (keyboard, mouse device, etc.) to the USB input and output connectors. For audio, connect mini-stereo cables between each audio source and the audio inputs on the Matrix. Connect the mini-stereo cables between the audio outputs on the Matrix to the audio device. 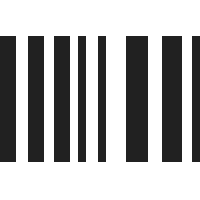 Plug in the power cord and apply power to the Matrix. The DVI, USB and Audio sources will be routed according to the current routing selection.